ISLAMABAD: Pakistan and the European Union (EU) on Monday agreed to a new strategic engagement plan for building a sturdy partnership in the fields of defence, trade, democracy, governance and human rights. The agreement to this effect was reached during the fourth round of a strategic dialogue between Pakistan and the European Union here. 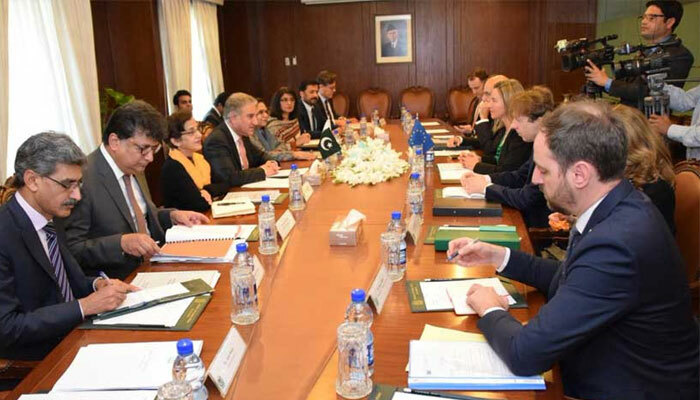 Foreign Minister Shah Mahmood Qureshi led the Pakistani side, while EU Representative for Foreign Affairs and Security Policy Federica Mogherini headed the EU side. Addressing a joint press conference with Federica Mogherini, Qureshi said the framework of new EU engagement plan and the agenda of Pakistan Tehreek-e-Insaf (PTI) government were too much similar in terms of human investment and economy especially. He said the present government was eager to enhance exports to Europe in order to fix the trade deficit. “We are interested in creating more jobs for the Pakistani youth through this increasing trading relationship with the EU,” the foreign minister said. To a question, he said the trade with the European Union had doubled after grant of GSP Plus status to Pakistan in 2013. “We have not actually utilised this facility to its maximum in the past, but our government intends to use it to the fullest as it is available to Pakistan till 2023,” Qureshi said. He said he also apprised the EU delegation about the steps taken by Pakistan to fulfill the Financial Action Task Force (FATF) commitments as well as the steps taken to cleanse the tribal belt, evolution of the National Action Plan (NAP) and the concrete measures taken by Pakistan armed forces in combating terrorism. He said both the sides were convinced that the solution lay in the dialogue process only. EU Representative Federica Mogherini said the current round of dialogue was an exception as the new strategic partnership plan would lay a strong foundation for partnership between Pakistan and the European Union to boost their economic cooperation in the days to come. She said trade with Pakistan had doubled in the last few years as Pakistani companies were enjoying great market access in the EU countries. Mogherini appreciated Pakistan’s stance on de-escalating tensions with India and crackdown by the Pakistani security forces on terrorists. She said the EU also appreciated Pakistan’s generosity towards the Afghan refugees as it was a great challenge to host such a huge number of refugees. The EU representative said the European Union fully supported Pakistan in its efforts and the role being played by it for the Afghan peace process. Mogherini said it was EU’s priority to make sure that Islamophobia did not find any place in its member countries. “Any kind of violence on the basis of religion, identity, language, belief or background was unacceptable,” she added. She expressed condolences for drought victims in southern Pakistan and also for those killed in the terrorist attacks in New Zealand, including nine Pakistanis.